Killed on July 30th, 1910, near Bonifay, Florida. Initially reported as the lynching of two men, no names were identified in newspaper accounts. Both victims were taken from the custody of a deputy sheriff and another guard while being transported to jail. Some details of the story cast suspicion on the deputy’s story. After stopping at a hotel for the night, the deputy sheriff decided to resume travelling in the middle of the night instead of waiting until the next morning as originally planned. The part of their journey where they were intercepted by the mob is described as “dark and isolated” – but surely it would have been less so if they had stuck to travelling by day as originally planned. 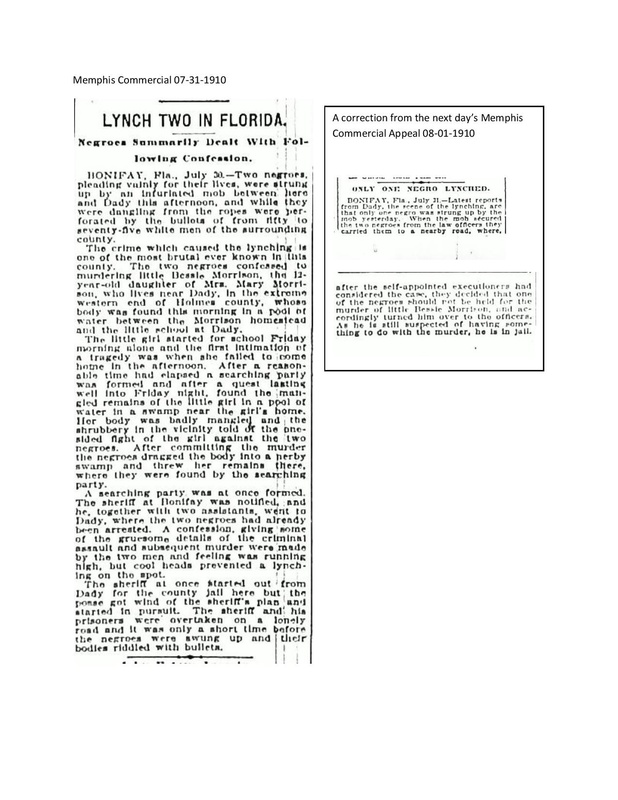 Even more suspicious in my eyes, a correction published in the next day’s newspaper indicates that only one man was lynched (name still not listed). The other man was also taken, but later he was returned to police custody after the lynchers determined he should stand trial (details are not offered as to why they lynched one suspect but allowed the other to stand trial). Despite the apparently extensive interaction between police and “mob,” there is no indication that the incident was investigated, or that the deputy and guard attempted to identify the lynchers. No charges or indictments were issued in the case, nor were the deputy and guard disciplined for losing custody of their prisoners.